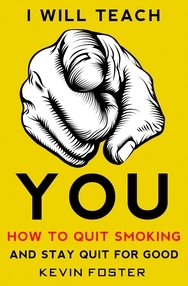 Would You Like to Learn How to Quit Smoking and Stay Quit for Good? If you decide to get it, I'd really appreciate it if you would take a couple of minutes to leave an honest review of it on Amazon (just click here, or look for the button that says "Write a customer review" on the book page above). Reviews are the lifeblood of books on Amazon; if there are no reviews on a book, people will assume that either nobody is reading it, or nobody cared about it enough one way or the other to bother leaving a review, and they'll just pass it by. And I do mean an honest review: I wouldn't ask — or expect — you to give it a 5-star rating and a glowing review if you don't think it deserves it just because I wrote it. Hope you find it helpful, and Happy New Year! Congratulations to our members who are celebrating milestones today! Happy Anniversary, mcsix! Congratulations on your first 15 years of freedom! Happy Lunaversary, Kajun! Congratulations on your first 178 months of freedom! Happy Lunaversary, grelouni! Congratulations on your first 178 months of freedom! Happy Lunaversary, pixiegirl! Congratulations on your first 174 months of freedom! Happy Lunaversary, riverwide! Congratulations on your first 174 months of freedom! Happy Lunaversary, SammyB! Congratulations on your first 171 months of freedom! Happy Lunaversary, PRB! Congratulations on your first 167 months of freedom! Happy Lunaversary, mojo! Congratulations on your first 157 months of freedom! Happy Lunaversary, my4boyz98! Congratulations on your first 154 months of freedom! Happy Lunaversary, Rosalie! Congratulations on your first 147 months of freedom! Happy Lunaversary, SDmaddog! Congratulations on your first 143 months of freedom! Happy Lunaversary, kookiewillow! Congratulations on your first 136 months of freedom! Happy Lunaversary, formybaby! Congratulations on your first 129 months of freedom! Happy Lunaversary, Vallen! Congratulations on your first 128 months of freedom! Happy Lunaversary, MidnightWolf! Congratulations on your first 127 months of freedom! Happy Lunaversary, Satya! Congratulations on your first 123 months of freedom! Happy Lunaversary, freebirdgirl! Congratulations on your first 116 months of freedom! Happy Lunaversary, mamashel! Congratulations on your first 112 months of freedom! Happy Lunaversary, Steph W! Congratulations on your first 110 months of freedom! Happy Lunaversary, Charisma_indigo! Congratulations on your first 99 months of freedom! Happy Lunaversary, Neidin! Congratulations on your first 70 months of freedom! Happy Lunaversary, sk wasaful! Congratulations on your first 49 months of freedom! there's a lot more to quitting smoking than just quitting smoking; now that we don't have our cigarettes to fall back on, where do we go from here? celebrate your freedom from smoking!